HERO2® camera. Twice as powerful as GoPro's original HD HERO camera, the HD HERO2 enables consumers and professionals to capture and broadcast their lives most exciting moments in professional quality 1080p HD video and 11 megapixel photos. The new HD HERO2 is now available at GoPro.com, specialty retailers around the world, and at Best Buy for MSRP $299.99. Arguably the most versatile camera in the world thanks to its innovative mounting system, renowned durability and small form factor, the HD HERO2 surpasses its predecessor with several technology upgrades. The HD HERO2's new processor delivers twice the processing power, taking full advantage of a new high performance 11 megapixel sensor that delivers more than twice the image detail along with professional low light performance. A totally redesigned wide-angle lens was required to take full advantage of the HD HERO2's increased image processing, resulting in a lens thatʼs twice as sharp as the previous model. And with the arrival of GoPro's new Wi-Fi BacPac™ and Wi-Fi Remote products slated for release this winter, the HD HERO2 will enable video remote control via the Wi-Fi Remote, smartphones and devices, tablets and computers as well as enabling live GoPro video broadcast from anywhere there is Wi-Fi or a mobile hotspot. Famous for its globally best-selling HD HERO line of wearable and gear mountable cameras, GoPro spared no expense developing the HD HERO2.GoPro created a new category of camera with the HD HERO back in 2009, and itʼs gone on to become one of the best selling video cameras in the world," says Nicholas Woodman, GoProʼs founder and CEO. "With these big shoes to fill, we invested massively in engineering the HD HERO2 to be one of the greatest, most versatile cameras of all time. We think weʼve achieved our goal and weʼre very excited to see the content our customers around the world capture and share with their powerful new GoPros." BacPac and Wi-Fi Remote products. The HD HERO2ʼs photo capture performance has also been significantly upgraded. In addition to much improved low light performance, the HD HERO2 can capture up to ten 11 megapixel photos in a one second burst mode as well as automatic time-lapse photos with quick .5 second timing between photos. This dramatically increases the success-rate when attempting to capture magazine cover quality photos during fast action sports and activities. GoPro also placed a priority on redesigning the HD HERO2ʼs user interface for dead simple ease-of-use. The HD HERO2 features a totally new, straightforward language-based user interface that eliminates the need for instructions. "The HD HERO2 is much, much easier to use than the original HD HERO. If you know how to use a traditional camera, you can use the HD HERO2 straight out of the box without instructions. This makes the HD HERO2 very powerful as an every day, easy to use consumer camera while retaining all of the features, modes and performance that has made GoPro the best selling small form factor HD camera to Hollywood," said GoProʼs Director of Product Definition, Rudy Samuels. existing GoPro mounts and accessories. 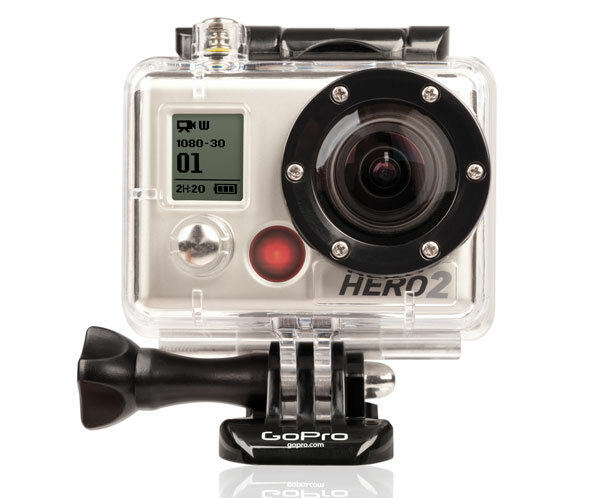 viously $259.99 - $299.99) through GoPro.com and GoProʼs worldwide authorized dealer network. The Wi-Fi BacPac and Wi-Fi Remote are also compatible with the original HD HERO camera, but functionality is limited to remote control only. Video and photo streaming is not supported.